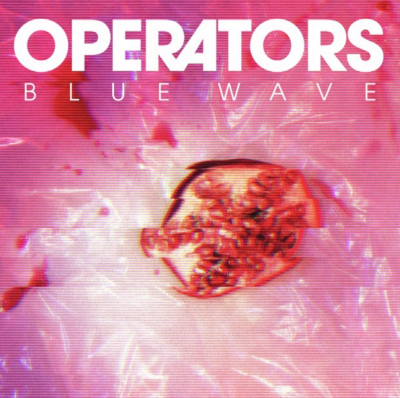 Operators’ second release and first full-length album, Blue Wave, carries the raucousness of singer Dan Boeckner’s previous—and current—projects. Elements of Handsome Furs, Divine Fits and most noticeably, Wolf Parade inoculate Blue Wave from start to finish to produce an album solidly rooted in accessible, dance-rock, electronic tunes that leave no synth untouched. It’s aggressive, it’s nostalgic, and it’s weird—a holy trinity of qualities that easily make it one of the freshest releases that 2016 has seen thus far. The album opens with the darkly frenetic track “Rome,” an electronic anthem that easily propels Boeckner’s vocals to center stage amid Sam Brown’s compulsive drumming style. Slightly distorted guitars spiral in full rotation around Boeckner’s visceral vocals, occasionally interjected with keyboardist Devojka’s subliminal trajectories. It’s reminiscent of Arcade Fire’s 2004 release Funeral, albeit stunningly more sophisticated, accessible and exploratory. The album travels along a trajectory that encompasses the organic sounds of analogue synthesizers, drum triggers and sampling pads to execute what can only be described as an ecstatic culmination of fully layered, infectious, electronic buzz songs. The second track, “Control,” fuses staccato synthesizers to fuzzed-out melodies that are so expertly tracked and layered that it becomes impossible to dissect all elements of the song independently of each other. “Mission Creep” surfaces as the fourth track on the album, introducing an aggressively selective composition of battling keyboards and synths aimed contentiously at the empathetic underpinnings of Boeckner’s vocals. Boeckner carries with him the same vocal physicality that he had alongside bandmate Britt Daniels in Divine Fits—a lurching timbre that’s somehow capable of embodying qualities that are simultaneously raw, sporadic and reverential. The album hits its halfway point with “Blue Wave,” but neither slows down nor breathes. On the contrary, the album gathers speed as the track cordially incorporates small doses of saxophone over synths lifted from Joy Division’s 1979 release, Unknown Pleasures. Boeckner howls in his distinctively recognizable tone, “Science would not tell us / Where to go.” The succeeding song, “Shape of Things,” again lends itself to Brown’s semi-industrial drumming style beneath immaculately timed keyboards and synths that circulate into a mind-boggling sequence of melodies, firing like a rapid succession of cannonballs into a musical battlefield. “Bring Me the Head” steals the show as the seventh track on the album, opening with an immediately accessible vibration of helium-inflated synths and calculated punches of tambourine, only to be cut short by a shock of white noise. Dynamic, irreligious and charismatic, the song could have been easily been re-titled “Queen of Hearts—circa 1980” for its darkly powerful allure. Zip-lining through an instinctual landscape of musical irreverence and non-punctuality, “Bring Me The Head” challenges “Blue Wave” as the most dynamic track on the album. Operators once again touch upon Boeckner’s Ian Curtis influence with “Evil,” a track that has all the vocal footwork of New Order’s 1991 re-recording of “Ceremony.” Boeckner channels the foreboding (albeit heavy duty) mood of Curtis, singing “When they come for you / All that’s left is your empty room / Still on the street / Evil / Still in your houses / Evil.” Operators don’t slow down until the 10th (and final) track, “Space Needle,” which is quietly similar in song structure to Wolf Parade’s “This Heart’s On Fire” from their 2005 full-length debut, Apologies to the Queen Mary.